Apple is reportedly developing MicroLED screen technology at a secret engineering and manufacturing facility located 15 minutes from Apple Park, with the tech expected to debut in future devices as a potential replacement for OLED panels currently supplied by Samsung. 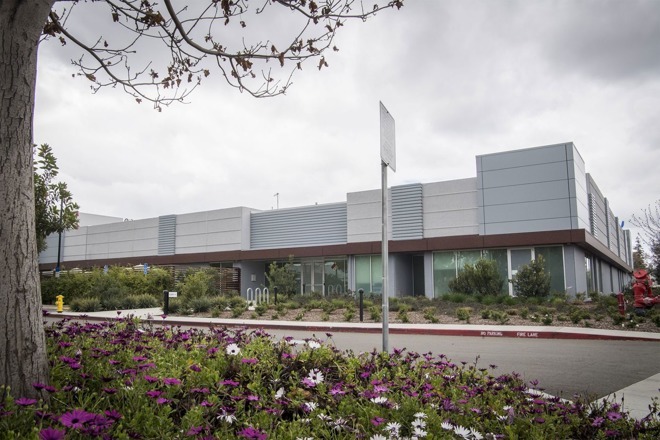 Located on a nondescript road minutes from Apple Park, the 62,000-square-foot facility houses about 300 engineers who are working on the next generation display technology as part of a project dubbed T159, Bloomberg reports. The plant is sufficient enough for small scale manufacturing operations, allowing Apple to keep MicroLED engineering and testing in house through the development process, a source told the publication. The person added that the company invested "a lot of money" on the facility and supporting assets in efforts to retain proprietary technology as long as possible prior to mass manufacture. Apple has a long history of developing components and engineering solutions in-house before seeding that information to manufacturing partners in Asia. The company's A-series processors that power iPhone and iPad, as well as the S-series chips in Apple Watch, matured in Apple labs prior to being farmed out for production by TSMC and other fabricators. A MicroLED screen facility, however, is a first for Apple. The company hopes to keep the technology out of the wild for as long as possible, a strategy that should afford it a significant leg up on competitors, the report suggests. Apple's plant produced its first Apple Watch-sized screen in late 2017, sources said, and is now capable of pumping out "a handful" of similar displays at a time. Currently, Apple uses Samsung technology in the OLED panel for iPhone X, and LG technology for Apple Watch. T159 represents Apple's first attempt at owning the display stack top to bottom. The new display technology, which is much more complex than that used to manufacture modern OLED panels, will allow devices to not only be brighter and less power-hungry, but slimmer as well. With more latitude afforded by an internally designed engineering process, Apple will also be able to fine tune display characteristics like color accuracy. MicroLED is still years from making its way to consumers, the report said. When, or perhaps more accurately if, Apple continues down the MicroLED path, the panels will likely appear in Apple Watch before moving to iPhone. There is a precedent for this, as we saw with the OLED displays that graced Apple's wearable years prior to their integration in iPhone X.
Apple first showed interest in MicroLED with its purchase of segment specialist LuxVue in 2014. Rumors following the acquisition suggested MicroLED would arrive in a 2017 Apple Watch model, while later rumblings pushed back that timeline to 2018. Today's report seemingly confirms rumors from late last year claiming Apple downsized its Taiwan-based display research and development project as it shifted focus to operations in the U.S. In the meantime, Apple looks to be doubling-down on their investment in OLED, with at least two new OLED iPhone models rumored for introduction later this year. Alongside Samsung's OLED contributions, reports suggest LG will handle panel supply for a 6.5-inch "iPhone X Plus" after receiving a $2.5 billion shot in the arm from Apple.